Pill holders with your custom imprint are convenient for storing pills, vitamins, herbal supplements and many other small items that need to be kept together. 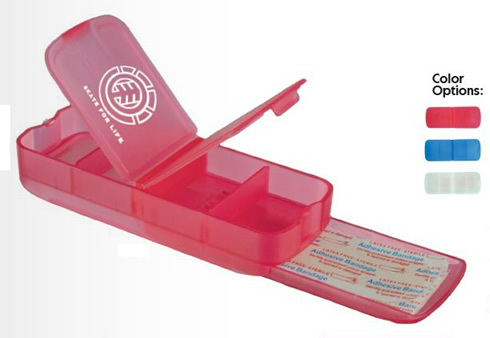 Consider giving away personalized promotional Pill Holders at your doctors office, health clinic, pharmacy or health fair. 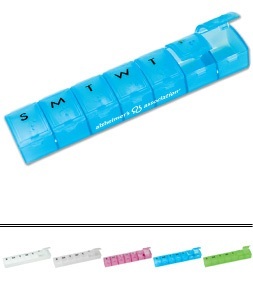 We offer slotted pill holders, traditional 7-day weekly pill holders and a pill holder that also has a bandage dispenser. 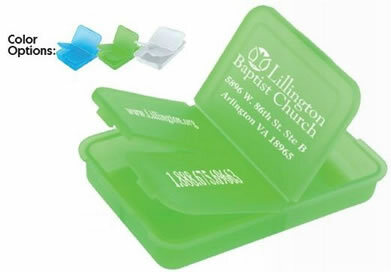 These ink colors are our standard imprint colors for our CK series Pill Holders. If a PMS Color match is requested add $50.00 per custom PMS color.